This is Jon. 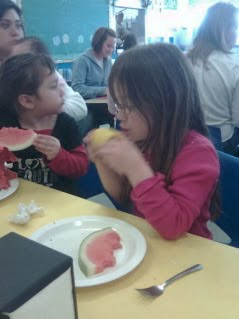 Delaney and her class had been planning a "Special Lunch" for their moms and dads for a while and Monday was the day! A few days before, the kids got to vote on what kind of food they wanted to have for the lunch. Delaney voted for chicken, hamburgers won. Delaney voted for carrots, corn on the cob won. Delaney voted for oranges, watermelon won. She didn't mind though. In a flash of maturity, she came home, told us what happened, shrugged her shoulders and said, "it happens." She didn't seem to mind because she scarfed down her food. Delaney sitting next to her friend, Bianca. Beind them in the blue is "Teacher Connie" one of Delaney's teachers. Very nice lady. Delaney has three teachers ("Teacher Debbie" and "Teacher Cindy") and all three of them are very nice and just great with Delaney. 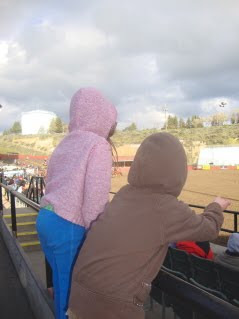 Fun at the CWU Rodeo! This is Jon. I got to have the girls to myself all day on Saturday while Brittany stimulated the economy with some out of town shopping and much needed reprieve from being a mommy for a day. After getting tons done around the house (mowing, weeding, watering, laundry, please hold your applause until the end, sweeping, mopping, deep cleaning the bathroom, a dump run in Old Wilson) the girls and I decided to head to the Ellensburg Rodeo arena to take in the college rodeo hosted by CWU's rodeo team (well, I was there all three days, but the girls took me on a date there on Saturday and Sunday). While not everything went as according to plan in last year's garden, the family really enjoyed the literal fruits (and vegetables) of our labor. We're adding a few new crops and have cleared out some space for what is hopefully a successful yield of food. The girls really enjoyed gardening, too. This year we decided to buy three Topsy Turvy planters - two for strawberries and one for a tomato plant. 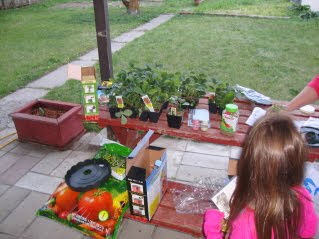 We bought 36 strawberry starts, and one tomato plant, so we'll see what happens. Proud owner of a Topsy Turvy. Adding the tomato plant to the planter before putting in soil enriched with Candadian Pete Moss. Yeah, we researched it. Finished products! We'll see how well they produce! Brittany and I pawned the girls off on Blue Grandma and Grandpa for a couple of hours so we could watch the PBR (Professional Bull Riders) at the Yakima SunDome. I cover plenty of high school, college and PRCA rodeo (Professional Rodeo Cowboys Association) and the PBR is a completely different tour that focuses solely on bull riding, which usually gets all the attention. 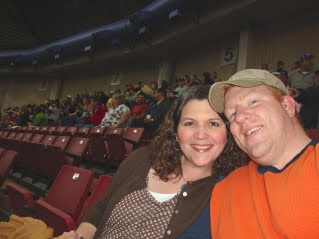 Brittany and I are rodeo fans, so we've got to have our fix of roping, barrel racing, steer wrestling and other roughstock events in addition to bulls. But we're growing into PBR fans, too, and glad we got to watch. Fire and fireworks to kick off the show. This is Jon. I've had Old Wilson running off and on, but after Sunday's tune up, I think he's going to be OK for a while. My friend Eric came over and lended his tools and expertise. I brought beer to the table and my wife made mini hamburgers. It was a pretty fair trade. Delaney has been adamant about her disdain for Old Wilson. She doesn't like the "hunk of junk." However, she might be more curious about the rig than I am. I caught her catching a glimpse of it as we were under the hood. See what I mean? She didn't realize I was watching her. 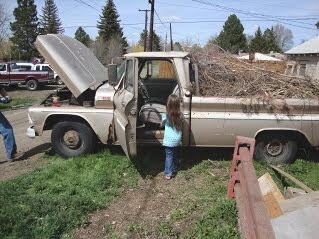 She won't admit it, but she really has a soft spot in her heart for the truck. Eric is seen here checking the RPMs on Old Wilson, it ranged anywhere from 1200 to 1700 when idling. By the end of the afternoon, he was sitting at around 1400 consistently. I thought Eric's "Mechanix" gloves were a nice touch. Swim lessons for the girls! This is Jon. 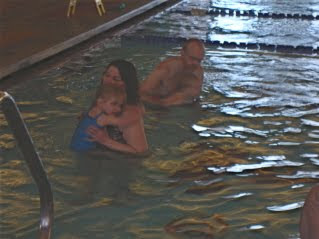 We signed the girls up for swim lessons this spring. One has literally jumped into it, while the other has cautiously dipped her toe in the water. Delaney is giggly happy every 30-minute session whereas Adelyn has slowly immersed herself. We've had two 30-minute sessions so far. The first session Adelyn just whimpered and clung to Brittany. I got in the pool to see if that would help and it didn't. The second session was significantly better, so we're hopeful Tuesday's session continues to improve. Delaney, however, (with her back to us in this photo) has immediately made new friends and has taken a few risks as she gets comfortable with her instructor. Both girls have loved the pool, but this is the first time Delaney has tried to put her face underwater. She hasn't done it completely (a couple of times on accident) but she's already done more during the two sessions than she has up until then. We're so proud. We've been outside quite a bit obviously with the weather turning into the legit spring season. 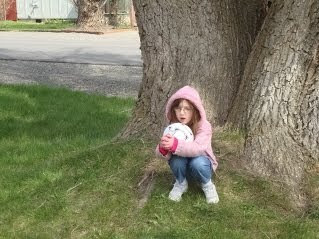 The girls recently got a soccer ball and that's been the center of their activity right now. They've also taken ownership of a gray workout bouncy ball and as you can see below, Adelyn got a decent workout. I was getting ready for work the other day and noticed that Delaney wasn't in her bedroom. Naturally I looked in Adelyn's room expecting to see Delaney in there, but not expecting to see this!